What would be able to make a fuel from renewable energy, water and atmospheric carbon dioxide? If you have an amazing innovation in mind here is your place to shine. The reduction of carbon dioxide to useful chemicals has received a lot of attention as an alternative to the depletion of fossil resources without altering the atmospheric CO2 balance. 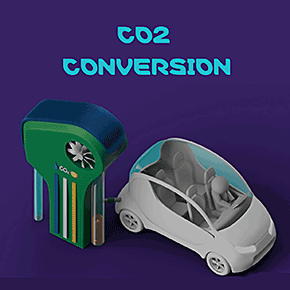 As the chemical reduction of CO2 is energetically uphill due to its remarkable thermodynamic stability, this process requires a significant transfer of energy. Achievements in the fields of photocatalysis during the last decade sparked increased interest in the possibility of using sunlight for photocatalytic reduction of CO2 for the production of solar fuels. The dream product generates a highenergy- density fuel from renewable energy, water and atmospheric carbon dioxide with an overall negative carbon dioxide balance.